Sigh. Let’s take it from the top, Chuckles. I’m fairly certain Mr. Jordan doesn’t do much of anything “in the hood” unless you’re referring to his brand of footwear or his newest stripper girlfriend. Next, are you saying that all black people live in the hood? If so, that’s very stupid and very racist. Just because many white people are good at golf and you’re not is no reason to get salty. Too personal? My bad. To be honest, I agree with you somewhat. 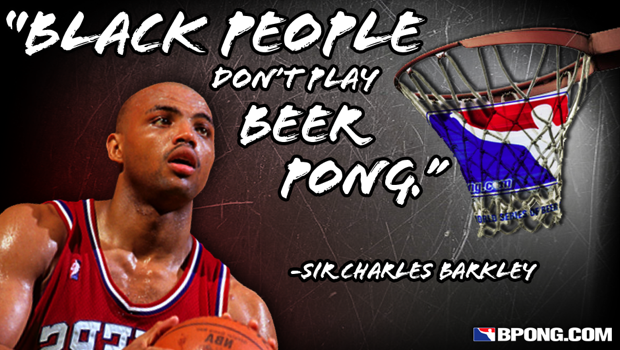 Not that black people don’t play pong, but rather that YOU would be bad at it. Don’t get me wrong. You do possess some behaviors that have been the hallmarks of some notorious pong players. You’re a compulsive gambler who likes to put tremendous amounts of money on terrible bets, similar to volunteering for cash games against Ross Hampton. You also like to drink a lot of alcohol and embarrass yourself. You got that .BAC up to .149 son! Even the cops pulling you over were impressed. I don’t recall you hitting much of anything from a range of eight feet in your whole career, unless you count foul shots, which no one should. Alright I lied. You were pretty good from the perimeter in your day. And the lack of any need for cardio in our sport would probably help you tremendously. But Chuckles, you are old. And irrelevant. The last time you were in college (the early 1980s) you were probably too busy getting “lunch money” from SEC boosters and drawling “War Eagle” to pay attention to the parties thrown by the little people where pong was prevalent. Here’s the problem, Mr. Barkley. You are no more aware of what young people do these days than Martha Stewart, unless she learned how to cornrow and Snapchat when she was in the clink. That includes young black people. How dare you make a blanket statement about any race without one damn clue about what you’re talking about? Do the world a favor and shut the hell up, unless you’re drunk as usual commenting on a TNT basketball game (young people love that channel, it’s right up there with the Hallmark network). Bottom line, black people do play beer pong. So do half black people. So do people who date black people. Your argument is flawed. Instead of defining what black people should not do, you should be encouraging their capabilities in all areas. Including beer pong. Your comments suggest a person’s “blackness” is taken away by doing something white people do. I don’t know if you recall, Sir Charles, but the very game that provided you with your fortune was once a majority, if not an all-white sport. How many people said the same things about black people and basketball back then? Just sayin’. I understand that you were probably just speaking out of an ignorance of the beer pong world. Don’t worry, our community is inclusive and we are very tolerant. We’d love to extend an official invitation for you to come to Vegas and play in WSOBP IX (on us) so that we can show you what the game is really about as well as the diversity of the players within it. Mr. Barkley, the proverbial olive branch has been extended. Hopefully you’ll take us up on it. Maybe you can team up with Ryan Cabrera since he’s already registered? And before anyone even thinks to question this article, rest assured it was written by a black beer ponger, with bonus points added for being a chick too. I hate it when someone decides they can speak as a representative for an entire race. Especially when they say something stupid! I’m guessing it wasn’t that he was too busy to pay attention to the parties, he just wasn’t invited. And probably because everyone knew he’d open his mouth and something stupid would come out. I’m afraid my (black) family member, who won our local satellite tournament and is participating in the Las Vegas event this year, will SMOKE the competition. Shame on you! Haha Sir Charles, like Michael Jordan lives in the hood! Never before has such a flippant, inconsequential remark taken so seriously. This was like saying “White people don’t play alley dice,” then someone else triumphantly pointing out the select few who do. *shrug* I took the comment more to say that black people from “the hood” usually aren’t the ones some would think would go to college, you know, where beer pong is most likely to be played. In this observation, Barkley comments on how people who grow up with so much that they can afford to go to college waste their time on such a stupid, inane activity. But, that one flew over your head.